I don't know what it will mean for the future. But today, for some reason, I was remembering the past. The first American President I can remember was Lyndon Johnson. 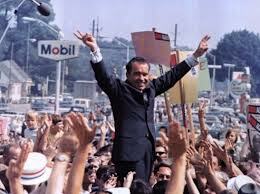 It echoes somewhere in my memory, the words "President Johnson." I was younger than Josefina in 1968. But I was very aware that an election was taking place. "What does the president do?" I asked my mother. She told me something to the effect that the president is responsible for the whole country, and that he "watches over" the whole country. My five year old imagination generated a vivid image: an enormous window where President Johnson sat, "watching" the whole country. The view from the window stretched in all directions. "He works all the time," my mother said. "He doesn't even have time to sleep at night. [I don't know if she actually said this, but this is what I remember.] The only sleep he gets is cat naps." She might have been thinking of Kennedy, who was known for his "cat naps." He never gets to sleep? Wow! My eyes grew wide. I assumed that he must sit in front of that huge window, all day and all night, watching the country. It sounded like a very difficult thing. Then there was an election. And President Johnson had decided not to run. Somehow, my mother conveyed this to me. "Gosh," I thought, "He probably wants to get some sleep!" I was awake on election night in November 1968. I remember seeing the new president on television, with both arms stretched out, giving his signature "victory" sign with two fingers of each hand. There was also this word that I remember hearing in those days, on the television news, every night, over and over: "Saigon...Saigon...Saigon...."
I assumed that the new president would take his place at the big window, and begin watching.